Volkswagen asks a lot of its Golf compact. It’s either a sensibly packaged commuter hatchback sedan, a pocket-rocket performance car as a GTI, or a handy small family car as a SportWagen. Now it’s got another job: crossover sport-utility vehicle. That last task falls to the Alltrack that makes its debut for 2017 with standard all-wheel drive, ride height raised by 1.4 inches, rugged lower-body cladding, front skid plate, hill-descent control, and an “Off-Road Mode” drive-control setting. As such, it gives VW a respectable contender in the slender field pretty much dominated by the Subaru Outback. Rugged lower-body cladding and a raised ride height are among the features that set the Golf Alltrack apart from the similar Golf Sportwagen. 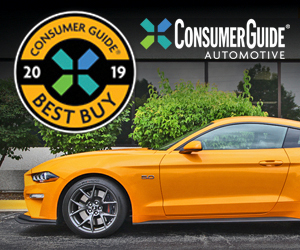 The Golf Alltrack and SportWagen share Consumer Guide® “Best Buy” laurels in the compact class. The pair shares basic packaging, even if running gear is somewhat different. 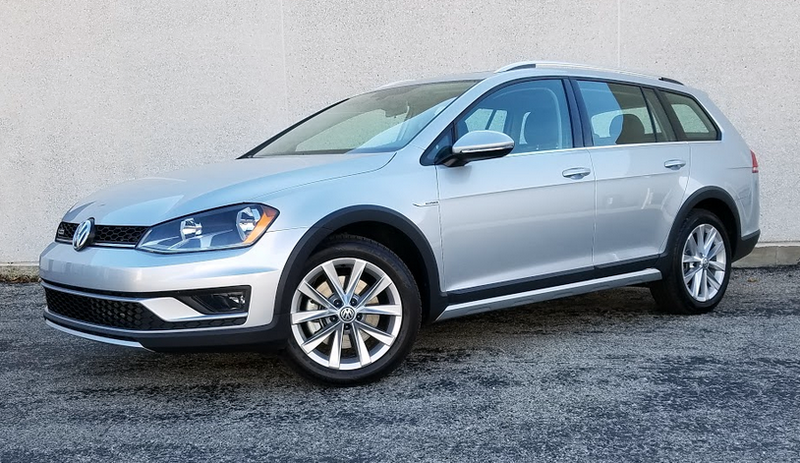 They have the same 170-horsepower turbocharged 1.8-liter 4-cylinder engine—though the Alltrack comes with a 6-speed dual-clutch automated-manual transmission, and the SportWagen offers a standard 5-speed manual with the option of a conventional 6-speed automatic. Alltracks come in a choice of S, SE, or SEL versions. CG editors got to try a midlevel SE on their home turf. The Reflex Silver Metallic test car was a pretty straightforward example. Devoid of options, it had a bottom line of $31,350 including the $820 destination charge. Included at that cost are 17-inch alloy wheels with all-season tires; fog lights; heated power-folding exterior mirrors; rain-sensing windshield wipers; panoramic sunroof; air conditioning; leather-trimmed steering wheel, brake handle, and shifter knob; leatherette upholstery; heated front seats; footwell lights and ambient interior lighting; rearview camera; push-button starting; “Composition Media” 6.5-inch touchscreen; Fender audio system for the AM/FM/HD and satellite radio with CD player; Bluetooth telephone connectivity; Apple CarPlay/Android Auto/MirrorLink capability; and VW Car-Net smartphone app interface. The Golf Alltrack is plenty roomy in the front row, and reasonably spacious in back. Cabin materials and overall fit and finish rank near the top of the compact-car class. While it rides a little more stiffly than a SportWagen, the Alltrack still handles easily. 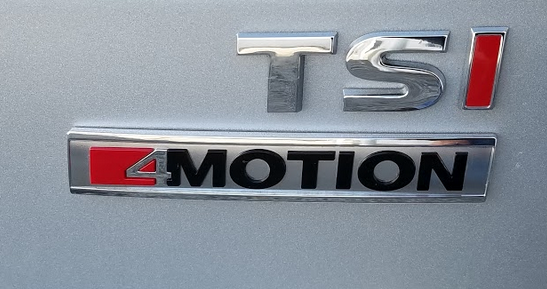 The included 4Motion all-wheel-drive system directs torque to the front wheels until conditions call for automatic distribution of some driving power to the rear wheels. The Off-Road Mode, accessible via a button on the console, alters traction-control behavior when off pavement. Though there’s some slight turbo lag when aggressively getting on the gas, the turbo engine produces nice power in general. (Torque peaks at 199 lb-ft at a lowish 1600 rpm.) For a little racier feel, punching up “Sport” mode holds the transmission in gear a bit longer—or drivers can take over for themselves via the shifter paddles behind the steering wheel. When spurred, the trans kicks down effectively for safe passing. After covering 192.2 miles in the Alltrack, this driver saw fuel economy of 23.20 mpg with 61 percent city-style driving. 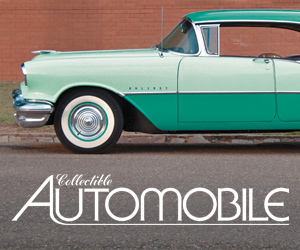 EPA estimates for the vehicle are 22 mpg in the city, 30 on the highway, and 25 combined. There’s generous space in the Alltrack’s cargo hold. Second-row seats fold nearly flush with the floor, opening up more than 66 cubic feet of space. There’s also a bit of small-item storage space under the load floor. Inside the Alltrack passengers will find seats that offer good support and comfort—though the rear seat backs struck this reviewer as perhaps a little too upright for long-haul riding comfort. There’s pleasing leg- and headroom in front, and sufficient levels of both in back. The driveline hump pretty much limits rear-seating capacity to 2 adults. General vision is fairly unobstructed, though rear headrests can intrude a little bit. Doors open wide for easy ingress and egress. All Golf Alltrack models come with a 170-horsepower “TSI” engine, and VW’s 4Motion AWD system. Armrests, dash, and front-door tops have soft surfaces with some give, but rear-door tops have grained surfaces without give. Personal storage is not bad with flocked pockets in all four doors (the front ones being quite large), a big glove box (even with the CD player and SD card slot built into it), a covered bin at the front of the console with auxiliary and USB ports, and pouches on the backs of the front seats. Only the cubby under the padded center armrest is small. The console has two open cup holders, with two more provided in the pull-down center armrest to serve rear passengers. Controls show up well and are easy to use, particularly the audio system. If this tester had any problem, it was getting the voice-command system to do his bidding. At one point the gizmo instructed him to speak quieter (the nerve! )—then still couldn’t execute the request for a particular radio station. There’s generous, easy-loading cargo space in back, which grows to 66.5 cubic feet with the rear seats folded. The 60/40-split seats fold almost flat, and with an uninterrupted surface from the cargo floor. Plus, there’s a central pass-through for long objects. The cargo bay has flipper levers to drop the rear seats, a 115-volt AC outlet and 12-volt receptacle, and rear-corner bins for small loose objects. Some “bonus” space is available under the floor around the spare tire. Where are the electronic safety and driving aids that have been springing up like wildflowers in recent years? There is a Driver Assistance Package, which brings forward-collision warning and mitigation, front- and rear-obstacle detection, adaptive cruise control, and park assist to the SE for just $845. To get other goodies like power front seats with lumbar adjustment, automatic climate control, and navigation requires stepping up to the SEL. 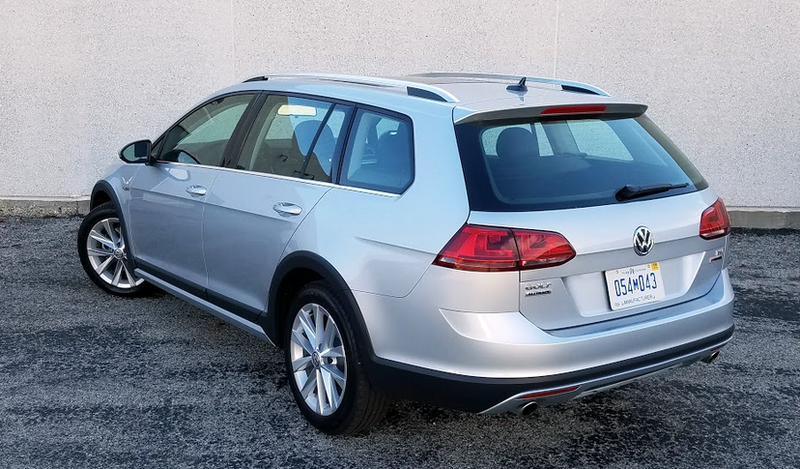 The Alltrack is less of an outright bargain than its SportWagen sibling, which newly offers a model with 4Motion. However, it is competitive on price with the 4-cylinder Outback, and, like the high-riding Subaru wagon, provides a good alternative for shoppers who may not need (or want) a full-blooded SUV. The Golf Alltrack rides 1.4 inches higher than the Golf Sportwagen, so it’s better suited to handle snow and rough terrain. Written by: The Daily Drive staff on January 27, 2017.on March 22, 2019.